You know I love a good giveaway and even more when it's for a company I have worked with and love their products. That's where Outfit Additions comes in! If you've never looked at their store let me show you a few of my favorites. Mmmk? Cute stuff, huh? 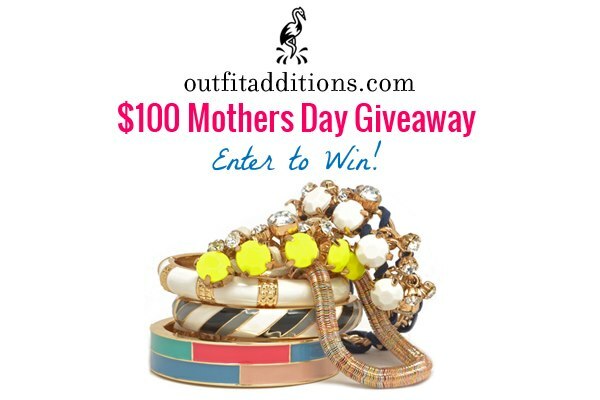 So they are having a $100 giveaway just in time for Mother's Day. Or maybe just to get yourself some new pretties for the spring/summer. 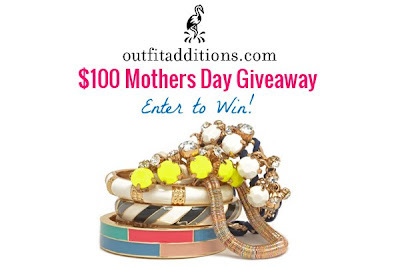 Who couldn't use $100 jewelry! The entries are simple and right now they are pretty low so your chances are good! While you're at it, shop around, free shipping AND returns, what's not to love?! I like a lot of the pendant necklaces, but this one is really cute! I just saw the post about this giveaway and was debating entering, so when I saw it here as well I decided I just needed to! I like the Muted disc art pendant necklace because like to wear mixed metals and it would pull them together. Loving statement necklaces so much!! I like the long gold dangle earrings .. I don't have any gold jewelry but it seems to be "in" now.. The petite leaf earrings are my favorite!!! I like the long bangle chain drop necklace! I love the honeydew bracelet! It's stunning! I love the pink bubble necklace! Top 2: Neon Crystal Link Bracelet & Silver Spike bangle! Those jewels are so adorable and cute. Thank you for sharing. I like the necklace best. It's delicate and simple. I just bought a letter neck last month. I love it so much.